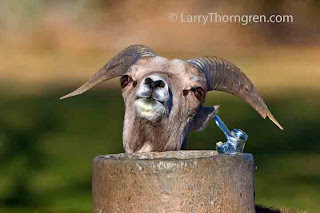 This young bighorn ram has learned that people will plug the drain and fill the bowl of this old concrete water fountain so that he can get a drink. I went over, put some leaves in the drain and pushed the button so he could get a drink. 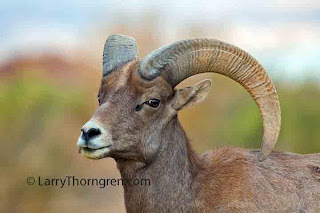 This young desert bighorn ram poses to show off his horns. 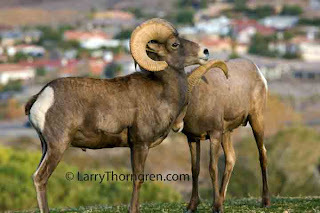 The desert Bighorns come to this City Park in Boulder City Nevada very often to graze on the green lawn. They are totally at home and unconcerned about human activity. 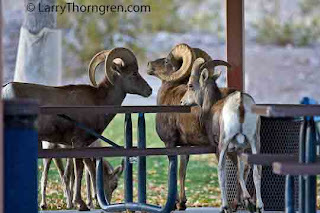 These two rams were found in a city park in Boulder City, NV. Part of Boulder City can be seen in the background. 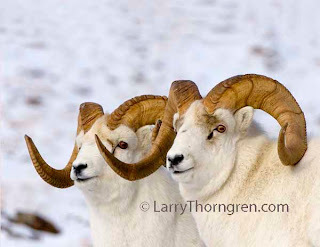 Bighorn sheep commonly come to the city park to graze on the green lawn and in doing so, entertain residents and visitors alike. The city restricts dogs from the park and the sheep have adjusted to the human presence and seem unperturbed by kids playing on the playground equipment. 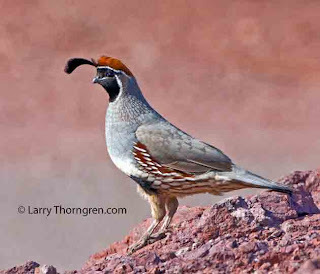 Here is a photo of a Gambel's Quail near Hoover Dam in Nevada. These quail are very common in this area, but are hard to approach for good photos.